The Romesdal fold of registered, pedigree Highland cattle is located off the coast of North West Scotland in the Trotternish region of the remote and beautiful Isle of Skye. We are a small fold with seven breeding cows and their followers. The Fold is Farm Assured and has Elite Health status. For such a small fold many colours are represented. For example, we have black, dun, red and white cows. Romesdal Highland cattle feed naturally on grass in the summer months and in winter are fed hay supplemented with bruised oats, shreds and cattle cobs for essential vitamins and minerals. The cattle are never housed. The contours or the land provide their shelter as do a belt of trees and an old drystane wall.Highland cattle are very hardy and have to be to withstand outdoors the long, harsh winters common in this region of Scotland. 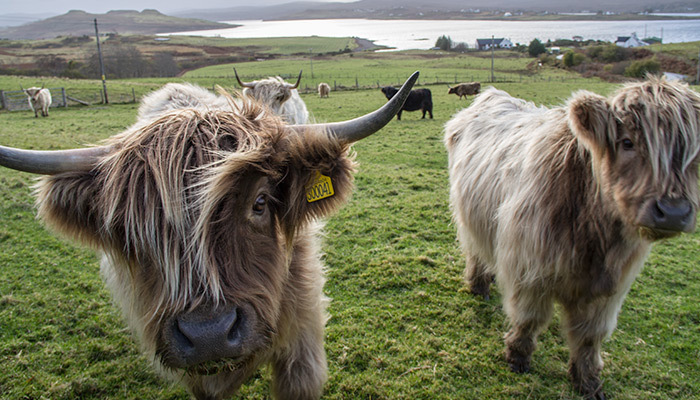 Highland cattle are therefore ideally suited to the environment of the Isle of Skye as it lies within the geographic area where the breed originated. They are tough beasts indeed and much less work than imported breeds of cattle, as they do not have to be housed in the winter as nature has provided them with a waterproof, shaggy coat and an extra thick hide. Highlanders have attributes other than low maintenance that makes them worth keeping. They are excellent mothers, for example, and have little difficulty calving. Also, the meat is superb and very low in cholesterol owing to the hide and hair doing the job that fat does in other breeds. We sometimes have meat available to order. If interested please get in contact.